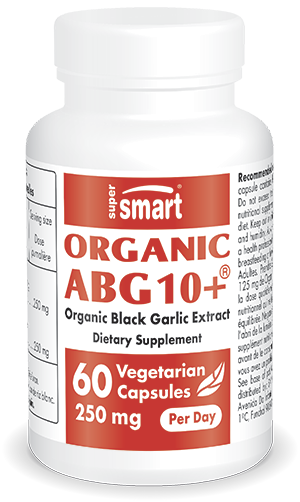 Our dietary supplement ABG10+® is formulated from an extract of black garlic, or matured garlic. Black garlic is so-named because of its charcoal colour and shiny appearance. It is also referred to as matured garlic because it is obtained via a unique process in which whole bulbs of garlic are fermented. Developed in Japan in the first decade of this century, this technique consists of leaving the garlic bulbs to ferment in a warm, humid container or environment, usually at a temperature of 60ºC-80ºC and a humidity of 70%-90%. Under these conditions, the garlic bulbs gradually transform as a result of the Maillard reaction – the slow caramelisation of the cloves. Black garlic is popular today both for its distinctive flavour and its exceptional health properties. Black garlic’s organoleptic characteristics and nutritional composition distinguish it from standard raw garlic or aged garlic. Its sweet, melt-in-the-mouth flavour has made it a popular ingredient in Japanese cuisine. It also contains high levels of antioxidants, particularly S-allyl-cysteine; indeed the many health benefits offered by black garlic are due to the presence of this phenolic compound which has been studied extensively in recent years. S-allyl-cysteine has significant antioxidant potency and a cardio-protective effect, which is why our garlic supplement has been specifically formulated to contain one of the highest concentrations of S-allyl-cysteine available in a dietary supplement. Black garlic’s superiority lies in its high content in S-allyl-cysteine. With significant antioxidant potency, this active compound protects cells against free radical damage and cellular ageing, and as a result, plays a key role in protecting vital organs too. Its antioxidant properties and positive effect on the circulation makes S-allyl-cysteine particularly good for protecting the cardiovascular system. With studies showing it may reduce cholesterol deposits in the arteries and so improve blood flow, many scientists are convinced of black garlic’s cardio-protective effect. Since black garlic was first discovered, scientific interest has increased significantly. Researchers are particularly interested in the beneficial effects of S-allyl-cysteine in reducing blood triglycerides and cholesterol, both of which are involved in the onset of physiological problems and cardiovascular disease. Initial studies in this field are opening up promising new perspectives for the preventive and therapeutic use of black garlic. Our garlic dietary supplement is formulated from a black garlic extract standardised to 0.1% S-allyl-cysteine, one of the most powerful doses available. It is in capsule form, with a recommended dose of two capsules a day.